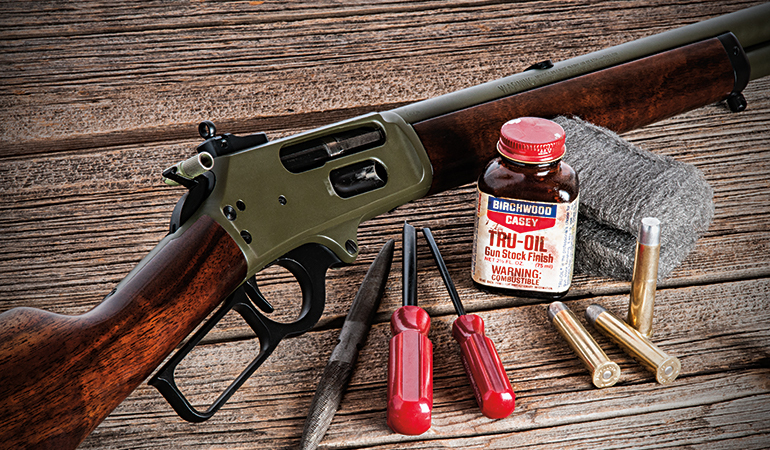 Here's how to turn a classic rifle into the ultimate hard-hitting lever gun. From Alaskan bush pilots to champion Cowboy Action competitors, savvy lever-gun shooters have proven Marlins to be completely customizable. Want to give your deep-timber hunting rifle a little more finesse? Here’s how to get started. Let me first point out that Marlin’s custom shop does a superb job of fine-tuning its guns. Several versions of the various models are available, and it’s a great way to get a very nice upgraded Marlin. However, if you prefer to dream up and select your own aftermarket options, you’re better off going to a custom builder, such as Grizzly Custom Guns, Wild West Guns, Brockman’s Rifles, or Dove’s Custom Guns. So your first step is figuring out just what you want and how much you’re willing to spend. If you’re patient and handy with tools, you can also use an owner-builder approach. Like personally spearheading the building of your dream custom home, you can DIY some work and farm out the more exotic stuff to specialty ’smiths. That way you can put a bit of your soul into the project, save a dime here and there, yet still ensure that the critical work you may not be qualified to perform is done right. Popular modifications include restocking, slicking up the action, lightening the trigger and giving it a crisp pull, installing upgraded iron sights and/or optics, and Cerakoting the metal parts. You can do some of this work yourself. More rigorous customizations include takedown modifications, caliber conversions to unique big-bore thumpers like the .50 Alaskan, shortening barrels, lengthening magazine tubes, and so forth. Most of this type of work is best left to the pros. I like to perform modifications that don’t potentially compromise the integrity of the gun myself. Two favorite relatively simple customizations include sights and stocks. Go to XS Sights or Skinner Sights for your upgraded aiming hardware. Both companies offer outstanding aftermarket sights for most Marlin lever guns, and XS offers superb scout-type scope rails. Order what you like—my favorites are the various ghost-ring rear apertures paired with a sleek, square-topped post-type front sight—and spend a Saturday afternoon carefully replacing the old sights. Don’t hesitate to knock out the rear barrel sight and replace it with a dovetail filler; you’ll find a less-obstructed field of view with it gone. Pair a good expanding bullet with a heavy, hard-cast lead alloy bullet for when you need deep-penetrating authority. These .45-70 loads are Barnes’s all-copper 300-grain TSXs and Garrett’s 540-grain +P Hammerheads. The carrier is by Galco Gunleather. Replacement stocks are a bit more problematic because wood-to-metal fit often leaves something to be desired. You can reshape the original stocks, order original Marlin stocks of different material (for instance, laminate wood rather than walnut or vice versa), or purchase true aftermarket stocks, such as those available from Boyd’s. I fit Boyd’s high-grade walnut stocks on my go-to Marlin 1895 GS. I abhor the paunchy forends on most Marlins. Thankfully, diligent application on your benchtop sander solves that problem. Mask the critical wood-to-metal fit areas, shape as desired, and carefully perform finish fitting with a fine-cut rasp and sanding block. For length of pull, I cut the stock shorter until it was just the right length, and then contoured a Pachmayr Decelerator pad to fit perfectly. I rounded the heel of the recoil pad shotgun-fashion to prevent it from hanging up in the armpit of a heavy coat when I shoulder my lever gun in a hurry. Finally, sand to 320, raise the grain with a wet cloth and sand the whiskers off when dry, then finish with True Oil or one of the Brownells spray-on stock finishes. Be sure to seal the inside of the stock and forend against moisture. Unless you’re a master machinist, you’ll need to use a specialist to perform serious custom work, such as the aforementioned takedown conversions, caliber and/or barrel length and profile changes, and so forth. However, such work is expensive. Unless you really want something unique, you can usually find a standard model configured to fit your needs, which is what I did with the gun pictured. 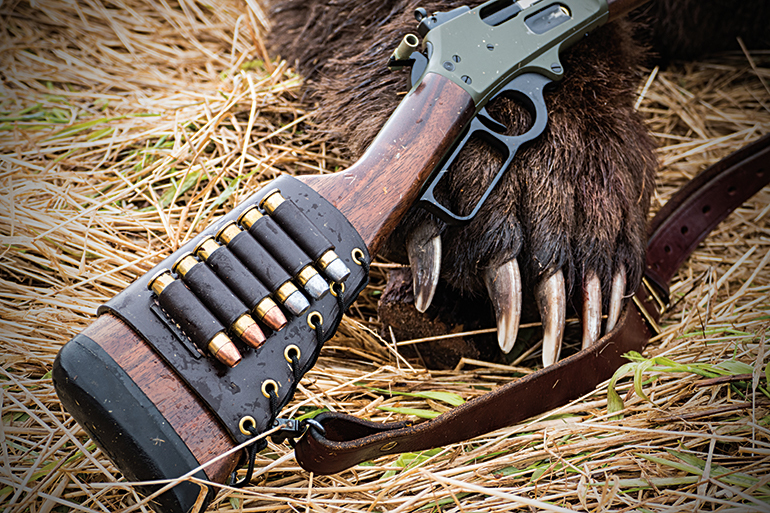 A standard 1895 GS with an 18½-inch non-ported barrel and four-round abbreviated magazine: It’s short enough, powerful enough, and has adequate capacity for backup work on big bears. After doing the final wood-to-metal fit and applying the finish, I had all the parts of my stainless rifle Cerakoted by Steve Pratt of Elk Meadow Performance. I like having as much corrosion resistance as possible for a gun intended for use in soggy regions permeated by sea air, such as the Alaskan Peninsula. Also, Cerakote kills the flash of bright stainless steel. As for color, pick your poison: I chose OD Green for the major parts, accented by charcoal black small parts. Since the rifle’s action was rougher than a sailor’s language, I sent it off to Lew Bonitz of Grizzly Custom Guns. He tuned the action, did a trigger job, bedded the stocks that I’d fit, and added his buttstock through-bolt. The latter is a much-improved method of attaching the stock to the action, particularly for a gun intended to shoot heavy-recoiling, big-game-thumping ammo. With your rifle action slicked up; the finish of your choice applied; stocks replaced, reshaped, or refinished; and those blessed ghost-ring sights installed, it’s time to find the ideal factory load or develop a good handload. Pick ammo loaded with the type of projectiles you want to shoot and test a few different brands. Likely, one will significantly outperform the others. Fine-tune your sights to put bullets on point of aim at your desired distance. My Marlin backup bear and timber-country elk gun loves Hornady 325-grain FTX and Barnes 300-grain TSX bullets, grouping around 1½ inches with both. I zero three inches high at 100 yards, giving me a useful trajectory to 200 yards—pretty far for a short-barreled lever gun. With the lighter hooved-game bullets zeroed three inches high, Garrett 540-grain hard cast +P Hammerheads impact dead-center at 100 yards and group just as well. There simply isn’t a better .45-70 big-bear load, and packing these massive penetrators along with either of the light, fast loads gives me the option of reaching out or punching deep. If you take the time to perfect it, that lever gun currently gathering dust in the closet corner will become your favorite classy shootin’ iron.